Last week, we went through the very quick, crazy re-release of the champagne colored adidas Predator Mania, and it was really was absolute mania. Since they are the boot worn by Zinedine Zidane when he hit THAT Champions League final volley 15 years ago today, we figured it would be a good idea to that a look back at that wonderful strike. Zidane began wearing Predator boots in 1996, with his first pair being the Predator Touch – the initial Predator to feature an iconic red tongue. Shortly after, in 1998, he wore the Predator Accelerator as France won the World Cup, and then he moved to the Predator Precision in 2000 as France won the Euros. Then the Predator Mania came along and in 2002 played a role in one of the most spectacular goals ever seen. It helped beat Bayer Leverkusen to hand Real Madrid their ninth European Cup. 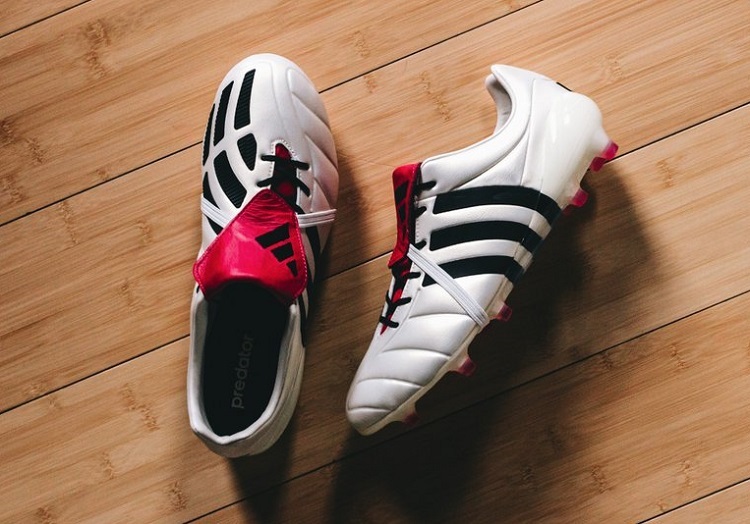 In reality, I’m surprised that adidas didn’t hold off and drop the re-release to coincide with Zidane’s volley; it would have significantly increased the market value of the boot. Then again, they completely sold out in seconds so marketing wasn’t really an area they needed help. If you are looking to get your hands on a pair, you don’t have many options. Sadly, eBay is the last remaining spot where resellers are trying to profit on their initial purchase. Price range right now; $600.